Even though September is almost here, we are still experiencing hot days and cool nights, the sun shines every day and no rain is on the horizon. Summers are truly paradise here in the Pacific Northwest. I planted a garden this year and am harvesting more zucchini, squash and cucumbers than I can keep up with. I’ve given so much away to friends and neighbors. I keep looking for new recipes to fix all the zucchini and squash. Pinterest has become a bit of an obsession. To go along with the summer vegetables and grilling, I’ve found a wonderful Rosé wine. It’s a Washington, Rosé from Columbia Valley called Soaring Rooster, from Tagaris Winery. It’s a young wine, vintage 2016 with an alcohol content of 12%. I found it quite by accident. I had gone to our local wine and liquor store in search of a particular German beer and there right by the carts was a display with this wine. The bottle looked interesting and the wine inside was a dark reddish pink, darker than most rosés I have seen and tasted. It was reasonably priced at $12 a bottle, so I grabbed a bottle. 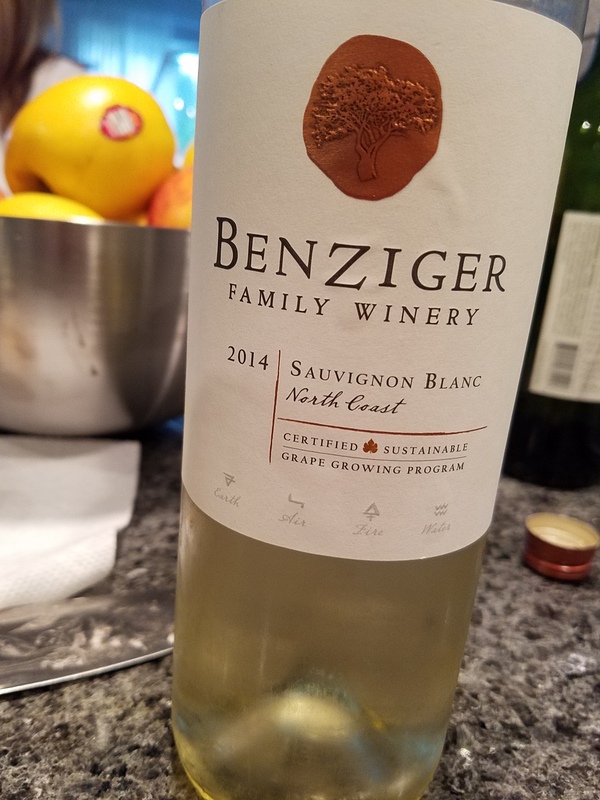 I opened it to go with grilled pork chops, roasted zucchini and a Greek cucumber salad. I chilled the bottle to about 45° in my wine cooler. The wine is off-dry, fresh and crisp tasting like strawberries and a hint of lemon. There was a subtle mineral after taste and a hint of jam. It was a great complement to the grilled meat and vegetables. This wine would also be delightful all by itself, just sitting and sipping on the patio enjoying the last of summer and on into the mild fall days. I will be going back and buying quite a few more bottles. After returning from a recent business trip, we’ve had a busy weekend. First it was a day of wine and chocolate tasting on Saturday on Bainbridge Island. We tasted our way through the island, seven wineries offering up some of their wines along with chocolatiers letting us sample some gourmet chocolates. We drove to the island on one side of the island, then winding our way across the island then took the ferry back across Puget Sound to Seattle. Tonight, for dinner, I fixed an early Valentine’s Day dinner. 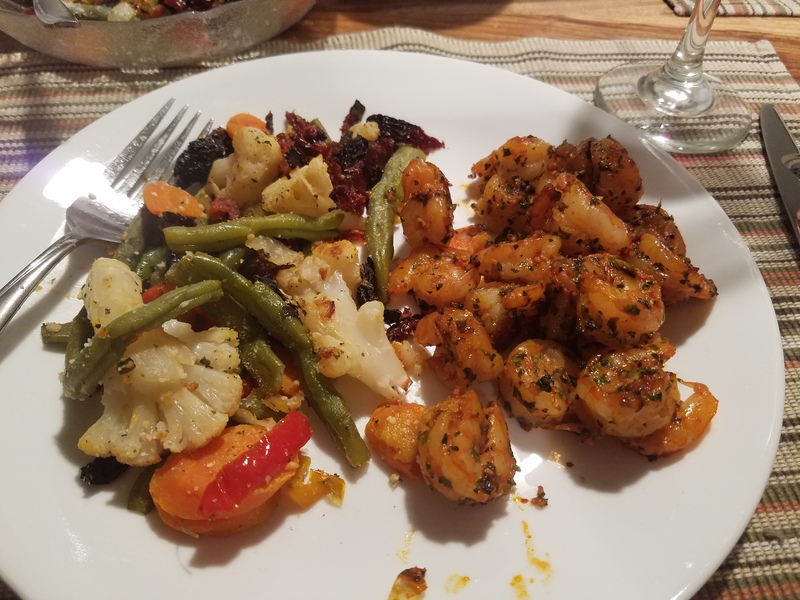 I made a shrimp dish, Garlic Seared Shrimp with Smoke Paprika and oven roasted vegetables. 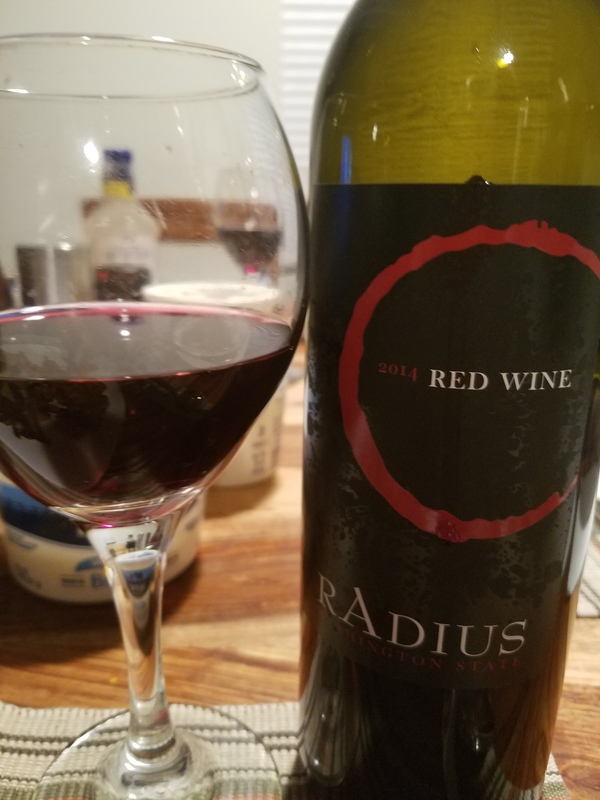 For the wine, I opened a red blend, Radius, 2014 from Walla Walla, Washington. The wine is a wonderful red blend that is soft and smooth, fruit forward, with cherry notes and a hint of oak. The wine just fills the mouth and tastes of dark fruit and ripe cherry, with a lingering finish. The wine went along very well with the shrimp and vegetables. Can you believe it’s the end of January already? The day light hours are getting longer here, we’re up to over nine hours between sunrise and sunset. I know that doesn’t sound like a super feat, but when you consider in the dead of winter we only get seven hours and thirty-four minutes of daylight, it is something to celebrate. For a mini-celebration I fixed a chicken dish, Chicken with Peppers, Tomatoes and Onions, that was really yummy. I can’t sew a straight line, but I can cook. I sautéed the chicken breasts in olive oil and white wine, added sliced onions and a can of drained diced tomatoes to cook the onions until tender. I added garlic, parsley, oregano, basil, salt and pepper. 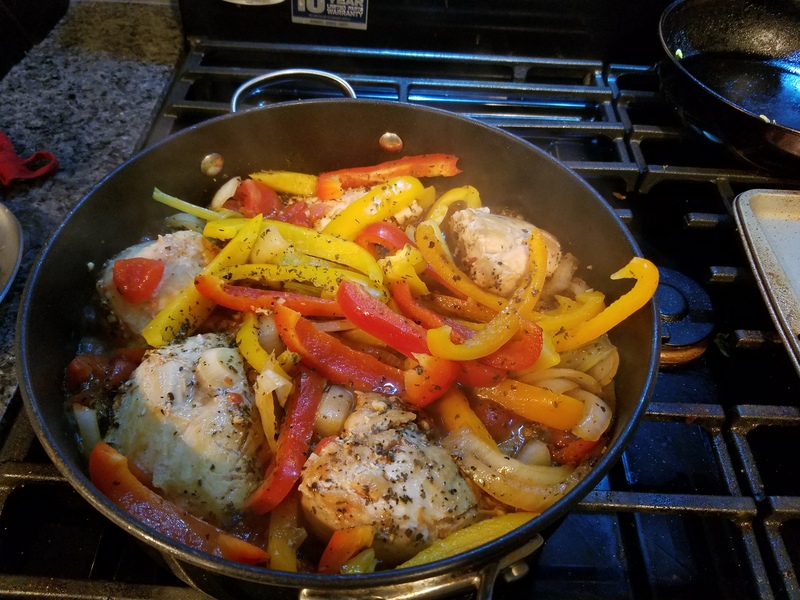 After the chicken and onions were almost done I added sliced bell peppers, red, yellow and orange, and a half cup of sun-dried tomatoes and continued to cook until the peppers were tender. It looked amazing and tasted that good too. For the wine, I opened a bottle of an Italian red wine that was a gift for Christmas. 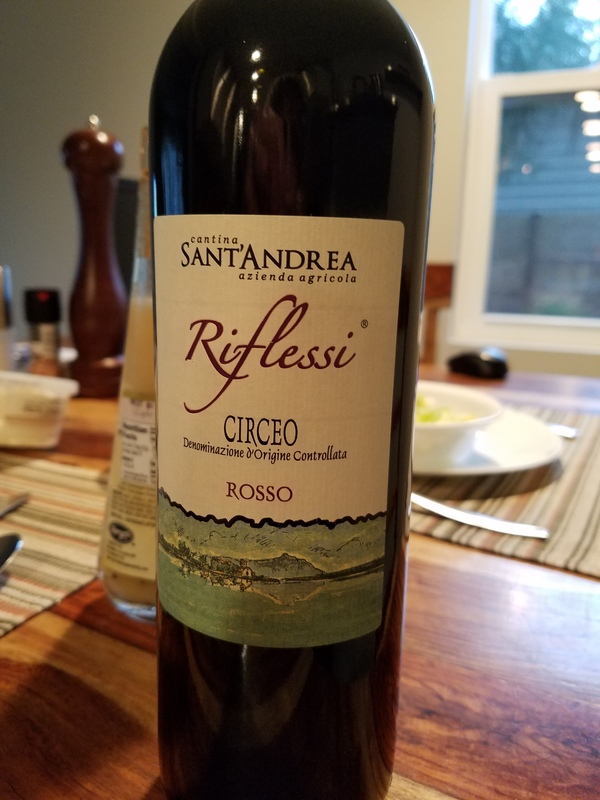 The wine, Sant Andrea Riflessi was a dark red color in the glass almost opaque and I could smell cherries and blackberries when I stuck my nose in the glass. The wine was dry and soft in the mouth. There was no harsh bite, just a lush smooth liquid. I could taste a bit of wood, dried fruit and tobacco. The wine was a 2015 vintage and had an alcohol content of 12.5%. The wine complemented the dinner perfectly, or maybe it was the dinner that complemented the wine. Now I want to make a wine trek to Italy in search of more deliciousness. 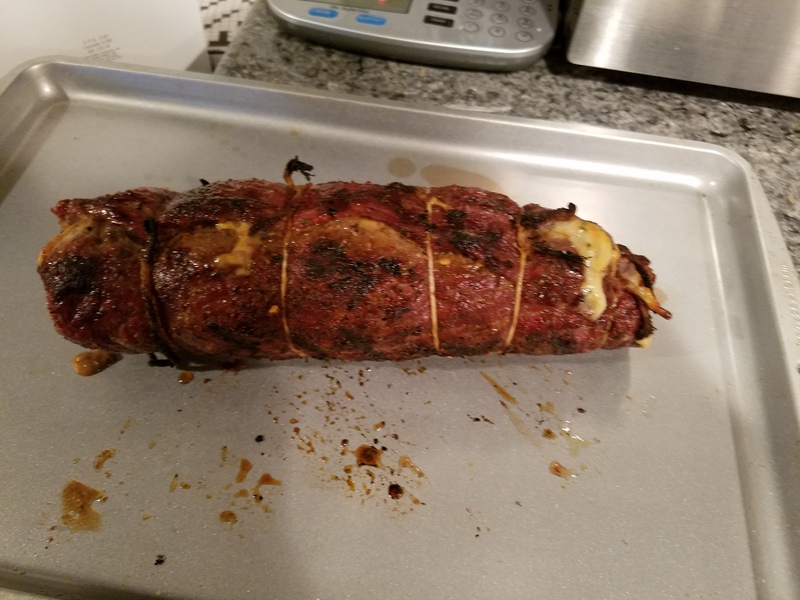 For Christmas dinner, I decided on a small standing rib roast, since it was just the two of us. I bought a four pound New York style standing rib roast with nice marbling. I cut about fifteen half inch slits in the fat at the of the roast and shoved in a garlic clove in each of the slits. Then I sprinkled salt and pepper on the top. 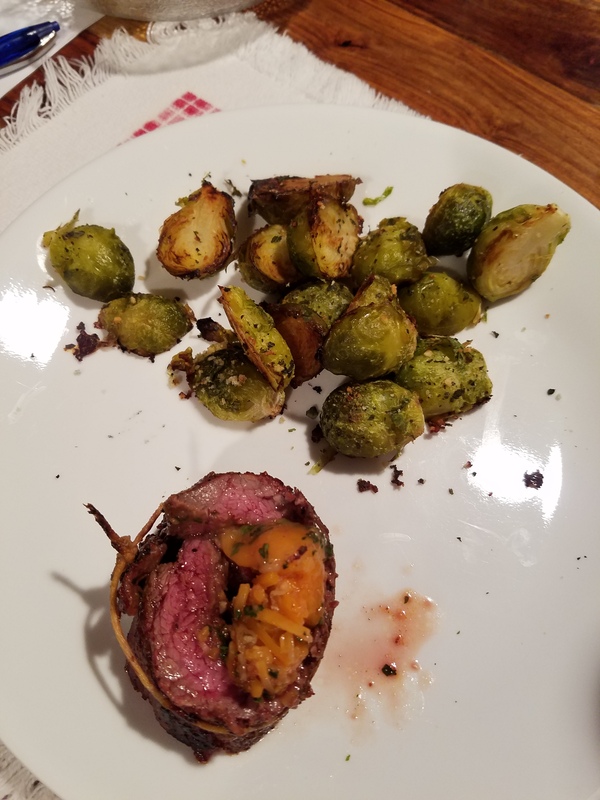 I put the roast uncovered in a 350° oven until the internal temperature was almost 135° (rare) in the middle, almost 2 hours. 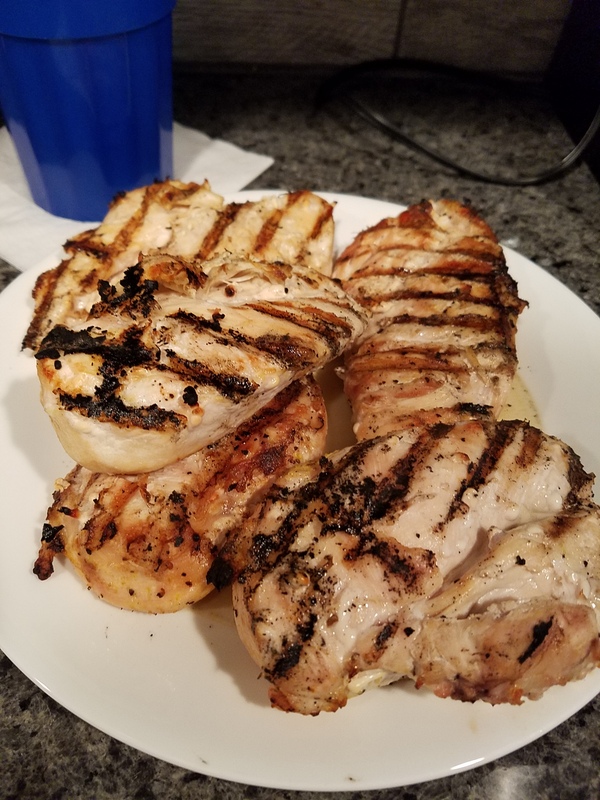 For the potatoes, I cut slices into each potato that were about a quarter inch wide and almost all the way through potato, leaving each slice hinged at the bottom. Then I drizzled some olive oil across the top and placed each potato in a small baking dish and put it in the oven along with the roast. 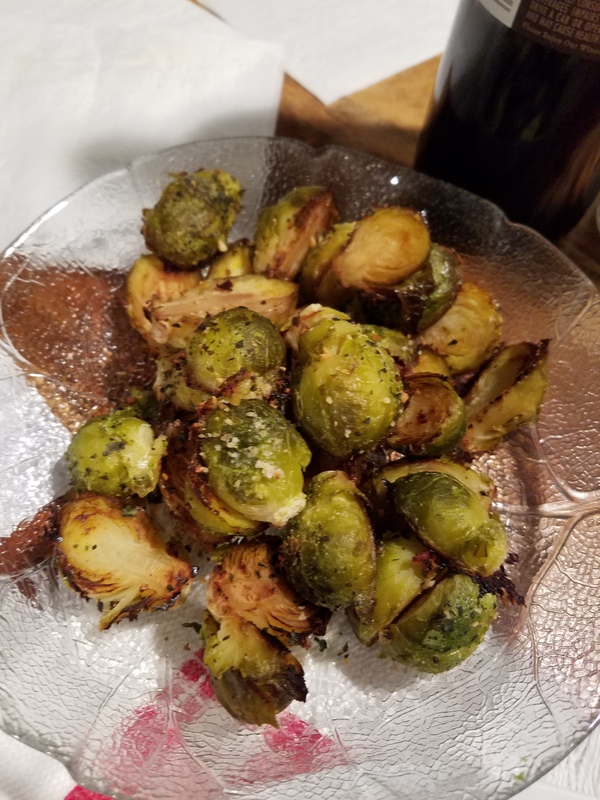 I then spread the vegetables on a cookie sheet, drizzled them with olive oil, salt and pepper and minced garlic and baked them in the same oven for about 45 minutes. For the wine, I opened a bottle of Wine by Joe, a 2014 Oregon Pinot Noir. The wine was a red color in the glass, translucent, I could see through the wine. The wine was dry with a hint of a smoky wood smell. I could smell the alcohol, too, which was 13.5%. The wine was a light Pinot Noir with a medium finish. This was a nice light Pinot Noir, good to just sit and sip or with cheese and crackers or fruit. 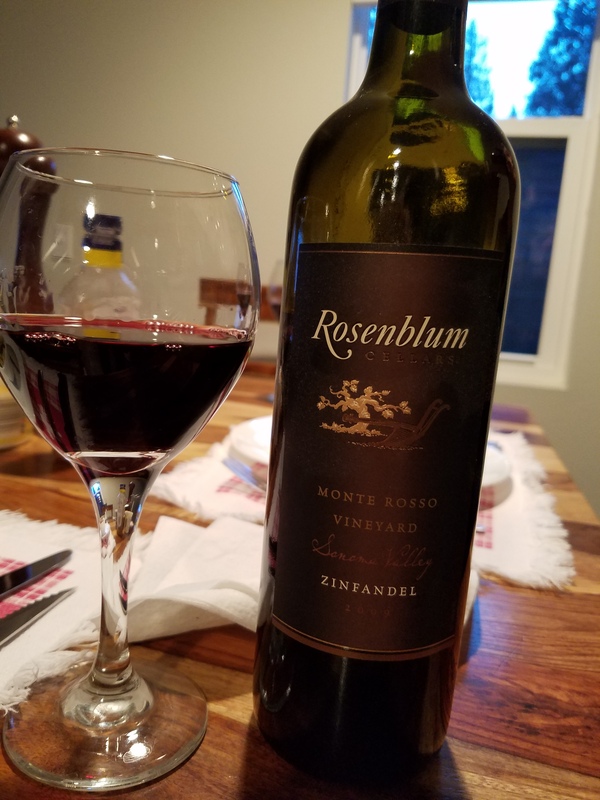 Maybe not the best wine to go with a standing rib roast, but it was super tasty and went along with the meat just fine.